When you shift via Health Insurance Portability? What if the health insurance policy you took is not suitable for you or if another insurer you get to know is offering the same coverage at lower premium or higher coverage at same premium? Or your current insurer company has bad customer supports and delays in settling claims? Whatever be the reasons, if you are not satisfied with your existing insurer than you can go for health insurance portability. The Insurance Regulatory and Development Authority of India (IRDA) provided an option to disgruntled policyholders to switch health insurance providers under IRDA Health Insurance Regulations, 2013. Let?s see the meaning and rules of Health Insurance Portability in India. Health Insurance Portability enables policyholder to switch his/her existing policy from current insurance company to new one. Health Insurance Portability does not mean carrying the same old policy to new insurer but buying a new health insurance policy without waiting clause period. Earlier when policyholder choose to move his/her existing policy from one insurer to another he/she had to forgo certain benefits such as waiting period for covering ?pre-existing diseases? which is not the case now. 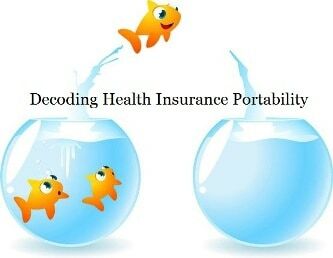 Health Insurance Portability not only applies when changing insurance providers but also when policyholder switches or upgrade his/her existing health insurance plan under the same insurer. Also note that only similar health policies are portable that means basic reimbursement to basic reimbursement or top-up to top-up. Individual health insurance indemnity Policies issued by non-life/general insurance companies, including family floater plans. Each individual family member covered under the group health insurance policy of non-life insurance can shift to individual health insurance policy from the same insurer and then can use the health insurance portability to switch to new insurer. The first and the foremost thing to know about Health Insurance Portability is policyholder needs to apply for porting atleast 45 days before the due date of policy because IRDA has offered flexibility to the insurer to make all necessary enquiries including medical tests before accepting porting application. However, if the age of the policyholder is less than 45 years, applying for portability up to 21 days before the due date is also entertained because medical test are waived off in this case. New insurer (where the policy is to be shifted) needs to decide whether to accept or reject the proposal within 15 days of receipt of the proposal with the relevant documents. If the decision is not made or conveyed to the policyholder, the proposal is deemed to be accepted. In case of delay in processing the porting application by new insurer and the renewal date of policy is about to expire, existing insurer on the request made by new insurer shall extend the insurance coverage for a short period not exceeding 30 days from the due date of renewal. Premium for this extended period is required to be paid by the policyholder on pro-rata basis. Every insurer has its own underwriting rules for assessing customer?s risk profile and if the new underwriter finds the proposal unsuitable, insurer has a right to drop the proposal. Policyholder needs to follow underwriting process just like new applicant, based on which the terms of porting are decided. The new insurer may charge the standard premium if the policyholder has not made any claims or does not have any pre-existing illnesses. However, the premium may be increased based on existing illness or past surgery. The only benefit of porting is waiving off the waiting period of any pre-existing disease. However, the waiting period will be relaxed depending on the period of continuous coverage with the existing insurer and will be applicable according to the rules of the new insurer. For example if there are two-year waiting period with the exiting insurer for certain diseases such as hernia, kidney stones etc. and policyholder has completed one year with the existing insurer, than he is required to wait for one more year with the new insurer before claiming expenses for such ailments with the new insurer. However, if there is three year waiting period clause for such ailments with the new insurer, than the policyholder is required to wait for two more years before claiming expenses for such ailments. Therefore it becomes utmost necessary to check the waiting period for pre-existing diseases with the new insurer before going ahead with the porting. In case the policyholder had been with the existing insurer for four years or more without any claims than he is hardly require to serve any waiting period with the new insurer. Taking health insurance policy or going for porting at the young age is hassle free but porting at the age above 45 years is not so easy. Underwriting rules are very stringent for the middle aged individuals and the premium tends to be higher besides a co-payment clause. Also medical tests are necessary before porting. Senior citizens aged 60 to 69 should not go for porting unless it becomes utmost necessary to switch because of the limited life cover with the existing insurer. Those who are above 70 are not going to get approved by new insurer. The general practice of the insurance company is to accept porting of the policies with no claims in past. You may have been healthy while taking your existing health insurance policy but may have suffered any disease afterwards which may not be covered by the new insurer, your existing insurer cannot refuse to renew your policy but new insurer can refuse your porting proposal. Even, if you are found diabetic or have hypertension in medical reports, your application is considered a risky one and the can be denied. Also, a poor claim history can be the spoiler in porting process. Incorrect or Inadequate Information, Delay in filing health insurance portability application, non-availability of previous insurance policy documents or break in insurance coverage (even for a day) continuity with your existing insurer are some procedural issues for rejection. Therefore it becomes important to know your policy renewal date and gather the documents in place at time. Non-availability of insurance copies of last three years could lead to rejection of your porting proposal. Also remember, asking for higher coverage may jeopardize your chances of acceptance of porting proposal. New Insurer will treat you as new applicant and you have to go through underwriting rules. All you past history and claims have been considered in deciding your new insurance cover. If you have accumulated no claim bonus over the years with your existing insurer, the same has been added by the new insurer while finalizing the value of your cover and premium is charged accordingly. Suppose you existing health insurance policy is of Rs.4 lakhs and you have accumulated Rs.65,000 as no claim bonus, your new cover after porting will be Rs.4.65 lakh not Rs.4 lakh and your premium will be adjusted as per higher insurance cover. There are chances that you might want higher cover with the new insurer and the new insurer after following underwriting norms may allow it. But one must note that the waiting period for enhanced cover shall start after porting and waiting period served with the existing insurer may not be counted. For example if you have certain disease and are covered for more than 4 years at risk cover is Rs.4 lakh with your existing insurer and now you want to enhance this cover to Rs.6 lakh with your new insurer after porting. Waiting period of this disease is 2 years with the new insurer. Since you have already served waiting period for cover of Rs.4 lakh with your existing insurer, so you don?t need to serve more for existing cover of Rs.4 lakh but for enhance cover of Rs.2 lakhs you will have to serve two years of waiting period with the new insurer. Therefore, if you are hospitalized for such ailment within 2 years of porting of policy and your medical bills comes at Rs.5 lakh than your new insurer will pay Rs.4 lakh only and rest you will have to pay. On the other hand if you are treated with the same ailment after 2 years of porting than the new insurer will pay your full medical bill of Rs.5 lakh. If claims have been made, additional documents like discharge summary, investigation report, etc. could be required. The New insurer will review the forms and seek details of your medical reports and claim history from your existing insurer through IRDA?s web portal. The existing insurer will have to provide the requested information within 7 working days of receipt of request. In case the existing insurer fails to do so, it will be qualified as a violation of Insurance Act. On receiving your claim history and medical details from your existing insurer, the new insurer will assess the application through underwriting norms and shall convey the decision of acceptance or rejection of the porting proposal within 15 days of filing the porting application. If no decision is conveyed to you within 15 days, then your application is deemed to be accepted. Please note that new insurer cannot charge any amount for porting the policy and also no commission shall be payable to the agent or intermediary for accepting the ported policy. Health Insurance Portability is easy for young and healthy individuals with minimum or no claims. However, one must consider all the aspects of the health policy such as waiting period, sum-limits, customer support, no-claim bonus, claim settlement ratio and claim settlement timing etc. and compare with other health insurance policies. Only if you are sure that your health insurance policy is not the best once, consider porting but read all the terms and conditions of the new insurer thoroughly before deciding.